Sinn Fein’s Mary Lou McDonald has apologised for any offence caused when she posed behind an ‘England get out of Ireland’ banner in the US. Speaking on the RTE Drivetime programme on Monday, Ms McDonald said: “In respect of St Patrick’s Day I think it starts certainly a conversation around that banner which has been up and down Fifth Avenue for a generation. 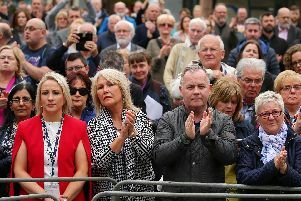 Ms McDonald’s comments followed an opinion poll published by the Sunday Business Post which showed a drop of five point in support for the party to 13%. In a report on the Drivetime interview, the Independent quoted the Sinn Fein leader as saying: “All of us have to be conscious of not just what we say and what is meant but also what is heard and what is understood. “For anybody who felt that was directed at English people I just want to reassure them that that’s not the case. Indeed I have blood relatives myself who are English and English people are very welcome in Ireland. However, Ms McDonald said that she stands over the anti-partition sentiment contained in the ‘England get out of Ireland’ slogan. “But as to the political sentiment behind the banner in terms of ending partition, now in particular as we face into the chaos of Brexit, decided upon in London, in England by politicians and political forces there, I cannot apologise for being a united Irelander and for wanting unity and democracy for Ireland. “In fact far from apologising for it I wear that political position as a badge of honour,” she added.